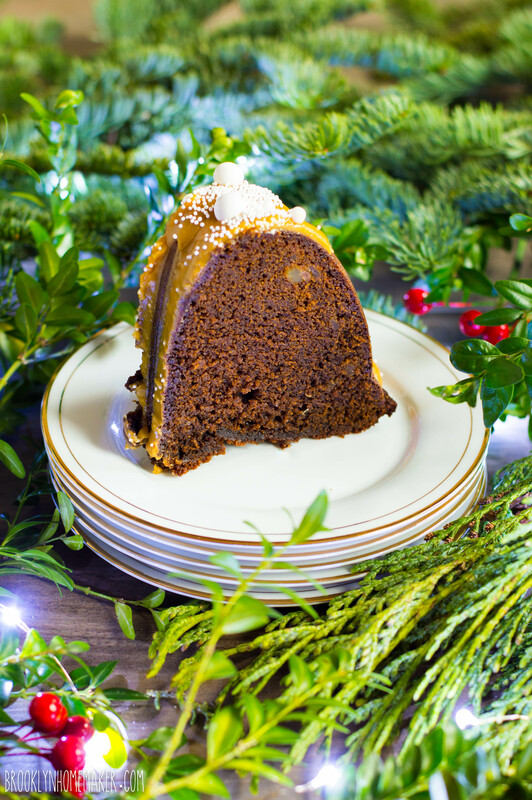 Love gingerbread recipes and this sounds amazing! 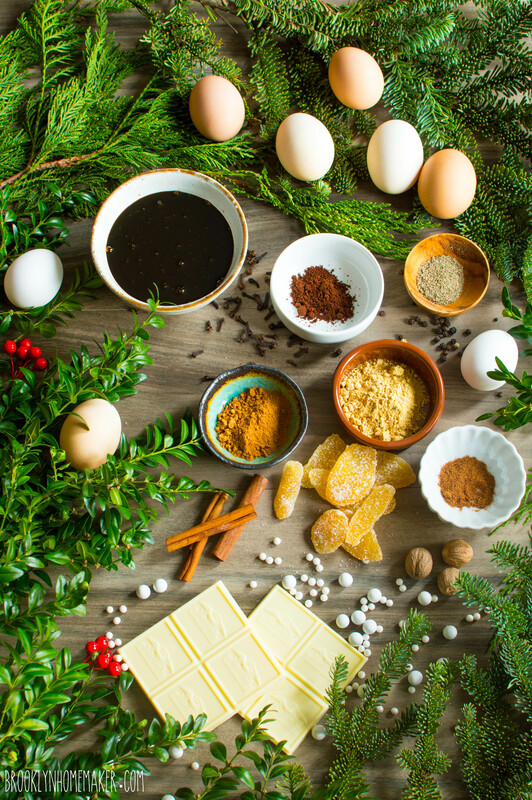 Thank you for sharing your experiments :) The idea with caramelising the white chocolate sounds intriguing, I’d love to try that! Oh my goodness! I laughed out loud so hard reading this! I am glad you tried it but now you know why Grandpa Loerzel needed brought a basket of chestnuts into the house for Grandma Loerzel to magically turn into food! I am still laughing. One of my favorite posts ever! I love your Caramelized White Chocolate Ganache Glaze! I am sure that I will do it, its amazing!!!! Thank you so much Diego! The caramelized white chocolate really is delicious! Ahhh I can completely relate to this! You’re so right…sometimes it can be a bit discouraging but you know what, everyone’s recipe still comes out tasting different. 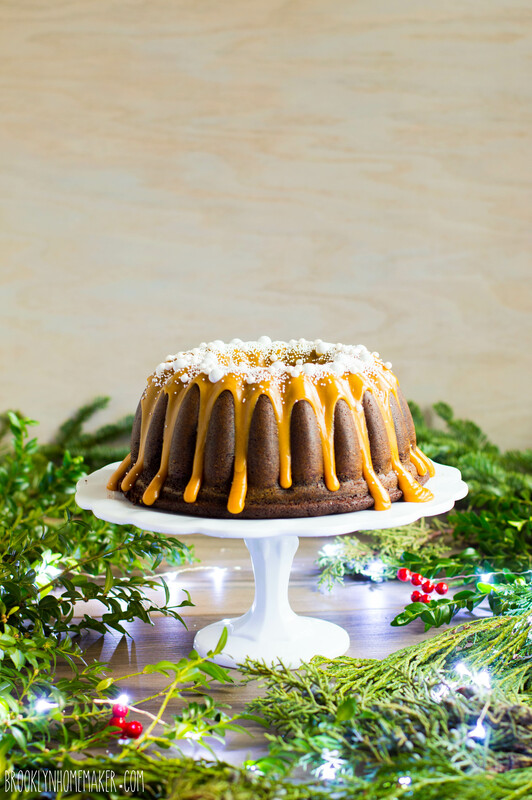 It’s like those old recipes handed down by grandma but no matter how many times you make it, it still comes out tasting completely different xD so with that said, I love your creative spin on this gingerbread bundt. I never knew that white chocolate could transform into a caramel…*MIND BLOWN*. Holy cow this has rocked my world. I’m not much of chocolate snob, but I definitely have a new found respect for white chocolate now. Merry Christmas, Tux! Wishing you and yours a beautiful holiday season & a very happy New Year. Thanks so much Tammy! Sometimes it really is better to just follow your heart, original or not. If a lot of people are making similar desserts, it’s probably because they’re so good and people like them so much! And this caramelized white chocolate, it really is mind blowing!!! WOW! Amazing recipe and pics!! 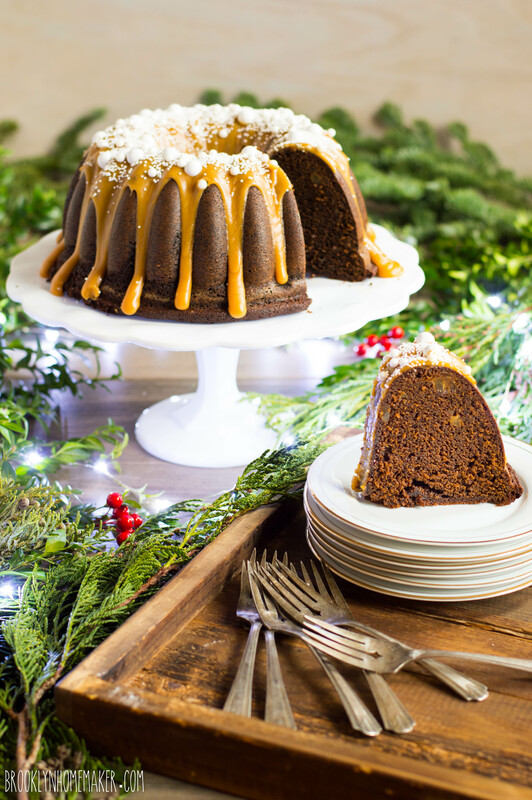 I am glad you did the Gingerbread Bundt cake, Tux! I am always trying your recipes and they are just the BEST! 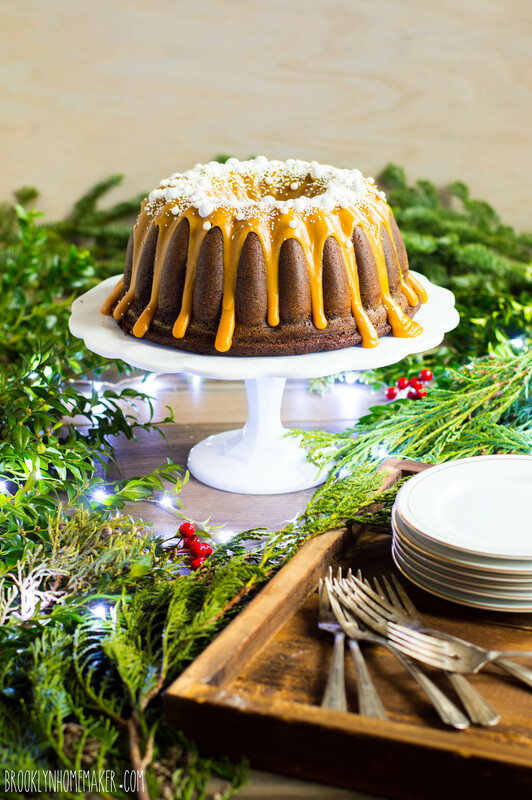 So this one is going to be a our Spanish Christmas table too ;-) And yes, caramelized white chocolate tastes sooo good (I made banana-caramelized white chocolate ice cream this summer for the first time ;-) ). And as usual, stunning pictures!! Merry Christmas! Thank you so much Lara! I’m absolutely honored to hear that my cake will make it on to your Christmas table!!! The caramelized white chocolate is time consuming, but it really is SO GOOD!!! This is beautiful fusion – even if it’s “all been done” there’s plenty of deliciousness to experience. 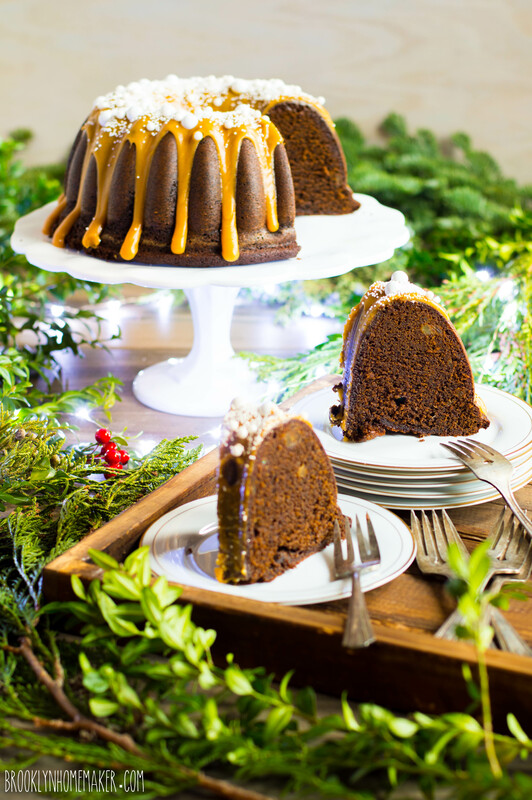 :-) Love this big bundt and I cannot lie! Thanks Kevin! If nothing else, it was a learning experience for sure, and made me go back to the more classic flavor I wanted all along! haha! Omigosh Omigosh am i FAMOUS?! Thank you so much for the shoutout! Wasn’t roasting the white chocolate the biggest pain in the a$$?! Can we talk about how you were almost injured by a chestnut? This post reminded me that this is one of those things that’s shrouded in tradition and i really have no idea why; I don’t know anyone who actually eats these! I’m pretty sure I’ve never had one before, unless it was when I was very little and buried the memory behind others that were more exciting (idk, maybe like santa, presents, peanut butter blossoms – things that are actually awesome and fun). These pictures are amaze-balls. The lighting is absolutely perfect, that drizzle is mouth-watering, and i LOVE the tiny little berries. it’s just the perfect touch! Hahaha! I was TOTALLY almost injured by a chestnut. And it was all for nothing, cuz chestnuts are not even worthy of roasting on an open fire. Fool me once, shame on… shame on you. Fool me… you can’t get fooled again. I hope you have a great holiday, and I can’t wait to see a post from you soon!!! You’re killing me! Just when I think it can’t possibly get better…it always does! I really love that you caramelized the white chocolate! Hahaha! Thank you so much Colleen! 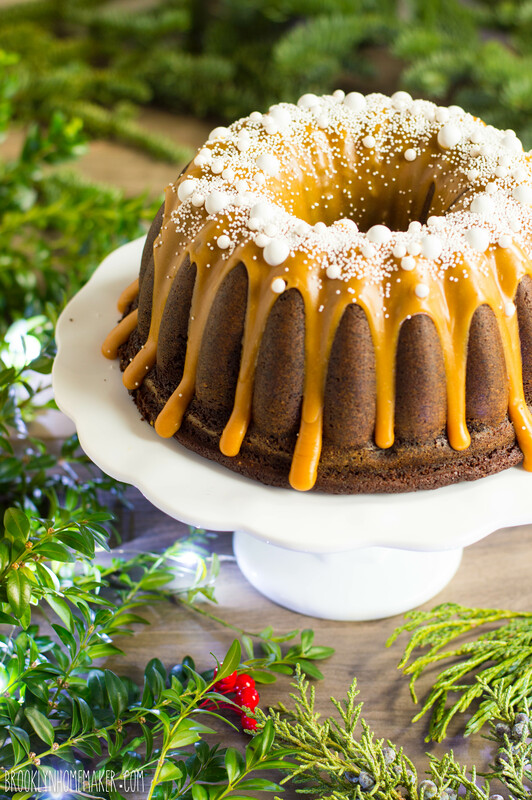 This is one fabulously lovely bundt cake! 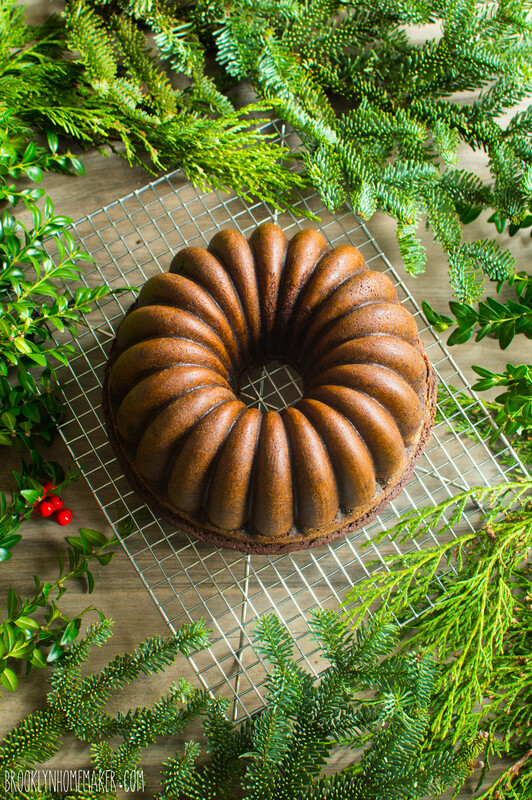 I am a fan and have many bundt cake pans for when the mood hits me. Your efforts through thick and thin ended with quite a beauty and it looks delicious. A great holiday treat. Cheers! Thank you so much Teresa! Happy Holidays! Tux, seriously!? I had to read your chestnut experience aloud to my husband. I can’t believe that! I’ve never had a chestnut either, and wouldn’t know if the crunchless experience was what all the fuss is about. That caramelized white chocolate sound incredible, and would be a perfect topping for an extra spicy gingerbread. Hahaha! I still can’t believe it all played out that way, and I’m even more shocked that people like chestnuts! Haha! Is it a terrible thing to say that I’m glad your first cake didn’t work? It is because I’m so happy that you made your spicy gingerbread cake. I love everything about it and especially how you decorated it. I’ve pinned it. Haha! That’s totally fair Karen, and to be honest I’m kind of glad I got to make the cake I really wanted to too. Thanks for pinning. BTW, I’m with you about not understanding why so many people love chestnuts…I think they are mealy and dry. Note that the song about chestnuts isn’t about eating them. When you roast them over an open fire, it gives off an incredibly pungent smell. Your gingerbread looks fantastic! And who knew you could caramelize white chocolate? That’s definitely good to know! I don’t think I really ever paid attention to the song, or knew that about chestnuts and open fires. I guess roasting them in the oven doesn’t have the same olfactory result. Ok, FINALLY someone has acknowledged publicly that Chestnuts are…well…not all that great! I have wondered for years if I was the lone person on earth who didn’t think they were just spectactular. I’ve hid my dislike for them for years. But now, I can safely say I’m not the only one who finds them pasty and flavorless! I worked at Williams-Sonoma during my college years, and the other store employees would literally take home JARS of them when we got them in stock each autumn. They’d open jars and share them around the store with us (“Just pop it in your mouth! Aren’t they soooo good? !”) and after I made the mistake the first year of popping a whole one in my mouth and nearly ralphing, I would take them and make a pretend nibble and then tuck it away in my apron pocket for discreet disposal at a later time. Ha! Well, Tux, this cake has inspired me to try caramelizing white chocolate. It sounds and looks just divine. Nice work! Hahaha! I’m sure glad I shared my experience with them now because your story is hilarious and I probably wouldn’t have ever heard it if I hadn’t. I almost didn’t too, because I was ashamed too, thinking I was the only weirdo in the world who thought they were gross when everyone else was waxing poetic and writing songs! You should absolutely try caramelizing white chocolate some time. It’s time consuming but well worth it when you taste the end result! So, this is too funny. I saw this post and didn’t dig too deep into it. I already had a gingerbread dessert I was going to do for Christmas. However, today I happened to swing by your blog and into this article. I was skimming through and then some how where I started reading was the Chestnut Story. This year I had made up my mind to be more seasonal and traditional with all of my holiday meals. It started at Thanksgiving when I found a recipe for a stuffing that used Celeriac, Chestnuts, and Sourdough. It started when I thought I bought chestnuts but it was pointed out to me a week later that they were intact hazelnuts. Thankfully I tracked chestnuts down and my husband and I worked on roasting them. I had dug around online and read about them and how to roast them so thankfully I knew about the chance of explosions… he he he We successfully roasted them and peeled them and I made my stuffing. Unfortunately they stuffing had problems that had nothing to do with the chestnuts. It was just a giant soggy mess. I ended up scooping it into rings and cooking it for a much longer time and in the end the flavor was good but the recipe needs some work. I like you wasn’t sure want to make of the flavor. To me it seemed like someone made a nut out of marzipan and I can’t stand that stuff but that’s a different story… I too forged on and was happy I did. As a savory I think it can work quite well. I haven’t yet tried them as a dessert but that’s y next attempt. I found a recipe for Chestnut Cake with Raspberries. In it the recipe calls for just a little chestnut flour and then you use the chestnut puree in the buttercream icing. I am going to give it a try and I’ll report back when I do. Oh my gosh I’m sorry it’s taken me so long to get back to you on this. Things have been so… crazy… in the world lately that I’ve had to take a little time off from blogging for a mental health break. But I’m back and I’m ready to go! Anyway! I’m glad I’m not the only one to have strange experiences with chestnuts! Coming home with hazelnuts instead of chestnuts is totally something I’d do, and I really came thiiiiiis close to making a celeraic and chestnut stuffing for thanksgiving! Too funny! When you perfect the recipe you’ll have to send it my way!!! Chestnut soup sounds great too, but I can totally see the pea gravel thing. They have such a strange texture and can totally see why they wouldn’t hold up to all that handling. You’re absolutely spot on with the marzipan comparison too, and even though I come from proud marzipan-loving German stock (my grandpa pronounces it motsy-pahn) I HATE marzipan! I can see how chestnuts could be better in savory recipes, but I have read some really tasty sounding cake recipes that call for chestnut flour and I still want to give them a shot. I’m obsessed with the idea of finding the good in a bad ingredient! hahaha! Here’s to… memorable experiences in the kitchen! Thanks for the comment and I hope to hear from you again soon! I think you’ll like both!